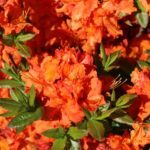 An exceptional Exbury azalea that is popular and reliable. The green foliage, which emerges somewhat glossy, is mildew resistant. Well known for the bright, vivid orange flowers displayed in huge trusses. Easy to grow, preferring moist, well-drained acidic soils and full sun to part shade. Prune after flowering as needed.